Maybe you've heard the Kings of Leon's fantastic track "On Call" from their album Because of the Times. If you haven't, then you should. You really should. If you care about the aesthetics of things Indie, that is. A HetPer reader mentioned the Kings of Leon when I last posted a bit about the Kings of Convenience. And since they're so close alphabetically in my iTunes, I tend to listen to them when I play the Kings of Convenience. I do enjoy them. Well, I enjoy both sets of Kings, it turns out. But let me tell you briefly why I approve of the Kings of Leon first and foremost. They are unapologetic about their influences. I like that. Actually, when it comes to Indie, I respect that kind of transparency. 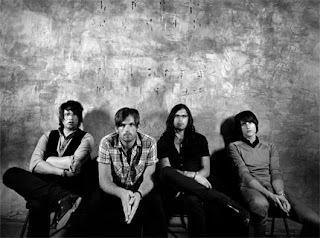 The Kings of Leon out themselves as indie rockers who are informed by such greats as Dylan, Tom Petty, U2, and so forth. And I especially like that kind of honesty. True genius does not reside in a domicile built by one single set of hands, after all. Tracks like "Knocked up" from the album Because of the Times will make you want to listen to some Dylan even though somehow you will be okay if you don't manage to right away. That's how adequately they inform their music. And the last favorite tracks of mine would have to be "True Love Way" and "Arizona." The Kings of Leon gave an interview to Spin magazine recently. Here is a snippet from it. SPIN: Now that you actually are rock stars, is it more or less fun to party like a rock star? JF: You actually party much more like a rock star before anybody knows who you are. Once people know who you are, you become sheltered by everybody that works for you, you know?" "Tracks like "Knocked up" from the album Because of the Times will make you want to listen to some Dylan even though somehow you will be okay if you don't manage to right away. That's how adequately they inform their music." Spin, yes. It's been a while since I last read it. I'll look at it more. The RS is getting annoying with all the mentioning of pseudo artists. Kings of Leon rock. Simple as that. I liked the last bit of the interview. How a band is more rock&roll before a band is known as rock&roll. Because of the Time is a great album. It should get more attention that it is actually getting. One of the better bands, no doubt.